Disaronno Originale , the most popular brand, has a characteristic bittersweet almond taste (although it contains no almonds or nuts) and is known for its distinctive appearance. 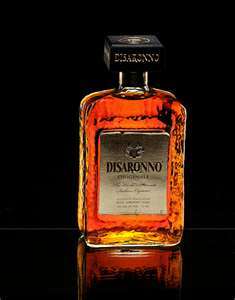 Disaronno claims its "originale" amaretto's "secret formula" is unchanged from the year 1525, and claims the Luini tale as its own particular history. Its production remains in Saronno, but the product is sold worldwide. Disaronno recipes that you love? svedka vodka-disaronna-coffemate french vanilla-cold fresh brewed coffee and ice mix in blenda delish!!!!!!!!!!!!!!! !